Indigenous villagers perform a spiritual ceremony to curse the developer of the Lower Sesan 2 dam in Stung Treng province, Feb. 28, 2015. Hundreds of indigenous villagers on Monday threatened to continue protests against the developer of a controversial hydropower dam in Cambodia if it does not halt construction of the project, which they say will negatively affect their cultural traditions and livelihoods. Dam Samnang, who represents more than 200 Phnong and Kuy indigenous villagers fighting the Lower Sesan 2 hydropower dam in Cambodia’s Stung Treng province, said protests would continue against the project’s developer if it is not shut down, including holding ceremonies to curse the company. “We will lead a peaceful protest against the company if it continues to construct the dam,” he told RFA’s Khmer Service. The 400-megawatt dam on the Sesan River is being jointly developed by Cambodia’s Royal Group, Hydrolancang International Energy Co., and a subsidiary of Vietnam Electricity, at a cost of U.S. $781 million, and is expected to provide the government of Cambodia with around U.S. $30 million in tax revenue annually. But villagers say the project will affect their culture and customs, disturb the burial sites of their ancestors, and destroy the rivers and forests they rely on daily for their livelihoods. 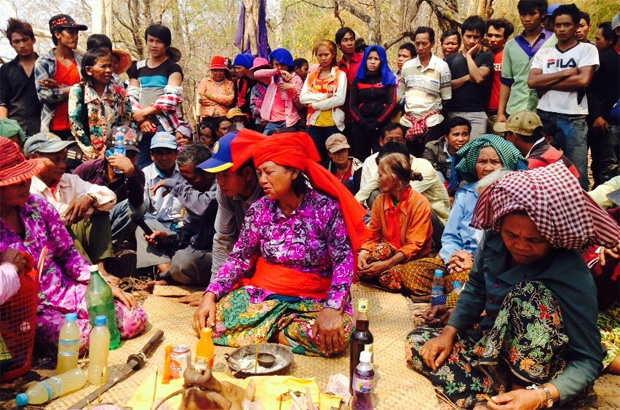 On Saturday, the villagers gathered close to the dam’s construction site in Stung Treng’s Sesan district and held a ceremony to curse the developer, calling on spirits to “bring the company to bankruptcy” and “force it to close,” and asking for help to convince the government to halt the project. Villagers also marched alongside trucks carrying banners, and expressing their strong opposition to the dam. They also voiced concern about compensation for being displaced by the project, which they say would destroy protected forest areas and kill rare fish. Villager Ki Mon told RFA that the dam would destroy the resources of nearby rivers and called on her ancestral spirits to punish those responsible for evicting area residents to make way for the project. “I urge the government to end its culture of intimidation, and instead use dialogue” to resolve the dispute, he said. Representatives of the government and the dam developer said Monday that the project would continue as planned, despite the threat of renewed protests. He added that the government would be unable to provide compensation for villagers’ homes according to market value, although he did not explain why, and suggested residents pursue their grievances through the judicial system if they refuse to be relocated by the project. “The government has a plan to provide appropriate compensation to the villagers—if they don’t like it, they can file a complaint with the court,” he said. Vang Y, a representative of the dam’s joint venture developer, which was granted a 45-year lease on the dam, refused to comment on the demands of the villagers, saying only that his company had been given a green light to proceed with the project. “We don’t want to respond to the villagers—we plan to continue construction on the dam to meet the government’s goals,” he said. Last December, around 300 villagers marked Human Rights Day by marching along the Sesan River in Stung Treng to raise awareness of the “negative impacts of hydropower dams,” including the Lower Sesan 2. The villagers also have called on authorities to scrap two additional proposed 300-megawatt dams in Ratanakiri province—the Lower Sesan 3 dam and the Srepok 3 dam. In June, Minister of Mines and Energy Suy Sem allayed concerns in parliament over inadequate compensation offered to villagers who face relocation for the Lower Sesan 2, saying the government has allocated them more than four times the area taken over for the project. Reported by Prach Chev for RFA’s Khmer Service. Translated by Samean Yun. Written in English by Joshua Lipes.